It’s the year 2018 and American refugee Dante flees from a prison camp in southern Spain only to find that not only do his clothes fall off at regular intervals, but there’s some cyborg doggie on his tail. There are also some annoying flashbacks to deal with that show that the poor doggie was badly beaten when young and came back enhanced as a bad special effect, as well as that something went a little wrong when Warden Kufard met Dante’s young lady Ula. It’s all a bit muddled but saved by its sheer awfulness and a chicken…no really, a chicken! Director/producer Brian Yuzna dazzled the genre crowd with his so-so 1989 directorial debut Society before destroying his fledgling reputation with the sort of CV that even a past his prime John Carpenter would pass up…Silent Night, Deadly Night 4 anyone? Yuzna retained some credibility for being a producer on Stuart Gordon's work Re-Animator, From Beyond and Dolls but on the evidence of this, the latest release from Fantastic Factory in Spain, that goodwill is being fast squandered. Anyhow I wasn’t going to let Yuzna’s track record ruin my evening’s entertainment. You see I'm a sucker for a doggie, even on screen. I even sat through Cujo! And where some may have sat through that movie, and cringed for their various reasons, the acting, the kid, etc…I just wanted to give the slobbering rabid fur ball a big cuddle. So on receipt I positively bounced into watching Rottweiler, thrusting the preview disc into my player with gusto. I couldn’t care what the film played like, I wanted to watch the cute dog…and hopefully the odd person getting ripped to pieces. The dog is an unconvincing mess of bad CGI, bad puppetry and well, bad everything really. The dog doesn’t really feature much either, instead we get to share more time than is healthy for anyone with the main character, Dante. Played by William Miller, Dante looks like an unfortunate cross between Eric Stoltz and Mick Hucknall and who wants someone like that as their leading man, especially when he spends most of the running time naked? Miller cannot act either so it really begs the question of why he was considered for the lead. The only glimmer of hope on the acting front is seeing Spanish actor Paul Naschy, now seventy, return to the screen as the sadistic Kufard, although quite why he picked this to return to movies is beyond me. It’s hard to shine when you’re up to your neck in celluloid excrement. Other characters are introduced only to serve as another victim for the undiscriminating mutt, who spends his whole time chasing Dante, only to chow down on someone else when faced with finally munching on his long-time pursuit. It comes as a surprise to read in the credits that this movie actually has a script, and that said script was based on a book meant as a political allegory. This film is soooo not a political allegory! The story, what screenwriter Miguel Tejado-Flores has left of it, doesn’t flow, doesn’t gel and just plain irritates the hell out of you. Instead of the political allegory it was meant to be, the makers have opted to make something Teminator -like with a doggie. Never has an hour and a half felt so long, the movie overindulging in flashbacks that serve no purpose except to muddle an already muddled narrative further. It’s not just the lead character that has amnesia it seems but also the script-writer and director. Yuzna does get some reasonable gore in the frame but most of this is muted by an obviously fake dog’s head being wobbled onto an actor's throat. Yuzna fares better with the attack-on-the-house sequence. It’s so over-the-top it’s literally falling down the other side. With a gagging-for-it housewife and constantly shrieking daughter it is the only set piece that kind of works and of course it’s topped off with a zoom in on that chicken! This one shot of a startled chicken, complete with overwrought score, is so laugh out loud funny that it saves the movie from no-rating oblivion. 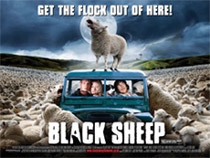 It is without doubt the stupidest things I have seen in a movie and also one of the most memorable. 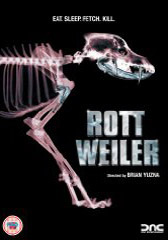 As time passes following the initial ordeal of watching Rottweiler, a strange and rather disturbing affection for this most awful of movies develops. It’s not difficult to see why the movie was booed off the stage at a Belgian horror festival however if you do end up renting it, do so just for that chicken!